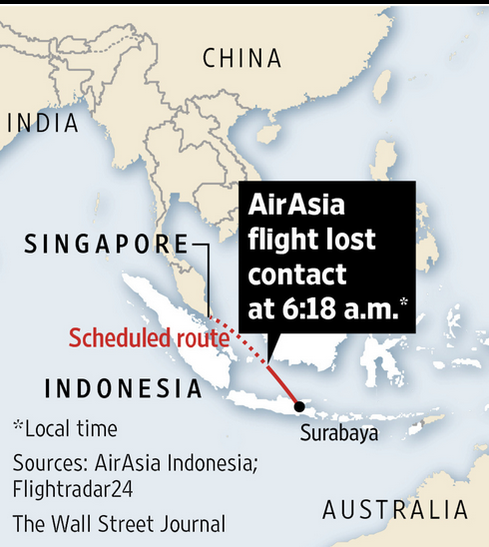 The world witnessed another tragedy in South East Asia when Air Asia Airliner 8501 went missing yesterday. Though there may be striking similarities with the missing of Malaysian MH370 but those are only superficial. Though there was one striking similarity. Both the planes didn't have GPS aided navigation. They were being tracked on radars. Air Asia 8501 carried 155 passengers on board. The Black box is yet to be recovered. The search operations are on though suspended during the night. Albeit some ships were reported to be searching the area where the Air Asia 8501 is likely to has vanished. Air Asia 8501 experienced bad weather that is the likely reason behind this tragedy unlike MH370 which had gone the radar after its pilots turned off the radio transmission. It also changed its scheduled course. This tragedy should make us more alert with regards to the safety of our air space. India has conceived GAGAN expanded as GPS Aided Geo Augmented Navigation System. This is with a view to provide better surveillance of our air space. GAGAN will provide better navigation and tracking facilities. It has an approximation of 1.5 meter horizontally and 2.5 meter vertically. The project envisaged at a cost of 7.74 billion Indian rupees is planned in three phases. It has established 15 Indian Reference Stations, 3 Indian Navigation Land Uplink Stations, 3 Indian Mission Control Centers, and installation of all associated software and communication links. The system will use eight reference stations located in Delhi, Guwahati, Kolkata, Ahmedabad, Thiruvananthapuram, Bangalore, Jammu & Port Blair, and a master control center at Bangalore. The Indian government has stated that it intends to use the experience of creating the GAGAN system to enable the creation of an autonomous regional navigation system called the Indian Regional Navigational Satellite System (IRNSS).